Fans of the renowned Russian poet Joseph Brodsky gathered in London on Aug. 25 to witness the installation of a commemorative plaque at the Hampstead home he used when staying in the British capital. 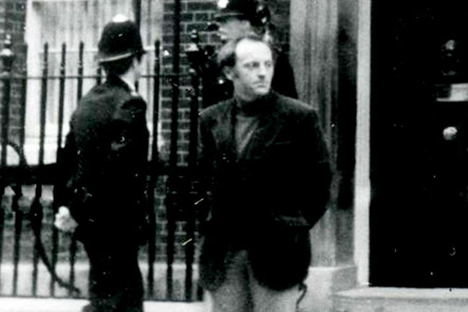 Brodsky's annual visits to Apartment 2, 20 Hampstead Hill Gardens, began in 1987 and continued until the year before his death in New York, aged 55, in January 1996. At the opening ceremony Brodsky’s friend and president of the Russian Poets Fund, Valentina Polukhina, explained why this place was chosen for the plaque. “You may well be wondering why we decided to place a memorial plaque for Joseph Brodsky on this particular house since he stayed in many other places in London," she told dozens of fans and friends of the poet who turned out for the event. "For instance, with Sir Stephen Spender, in St. John’s Wood, or with Margo Picken (for whom he wrote his poem The Thames in Chelsea, in 1974) in Kensington, or with Alan Myers, his translator, and his wife Diana (you might look at his cycle In England, 1976), in North Finchley. "There are many other places related to Brodsky’s days in London. But Hampstead has a special significance in Brodsky’s biography. In October 1987 he was staying in this part of London with the great pianist Alfred Brendel when the news about Brodsky’s Nobel Prize for literature was announced. He and the writer John le Carré were having lunch in a Chinese restaurant in Hampstead at that moment. Hamptead continued to play a key part in Brodsky's life until the very end, Polukhina added. Polukhina said that Brodsky was drawn to the British through an admiration for "English ironic self mockery and a lack of emotional display." Brodsky's merging of English poetic traditions with Russian created a new poetry, she said. "Joseph Brodsky mastered and appropriated the English poetic tradition and brought it into Russian poetry, creating an entirely new, previously unthinkable poetic harmony. In 1963, he wrote his great Elegy to John Donne. “After hearing the poem, Anna Akhmatova called Brodsky a genius." It was Brodsky's gift to the world of letters, Polukhina suggested. England as personified by John Donne and W.H. Auden, was to remain his poetic ideal, she added.